Greetings Dearborn brides, grooms and friends! The big day is approaching! We’re sure you’ve planned every detail down to the smallest flower. 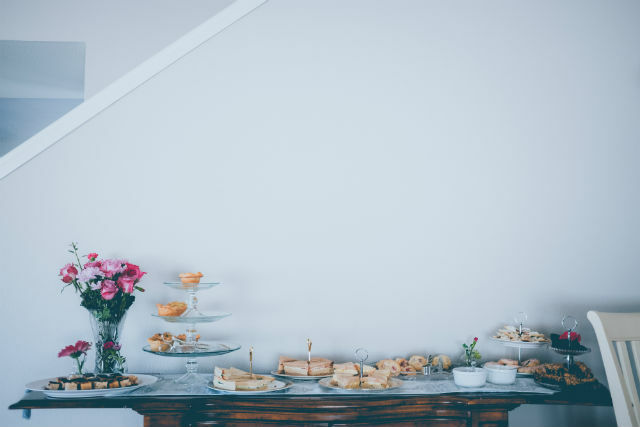 But there are a few exciting events that take place before you say “I do.” The bridal shower is a time-honored tradition that gives your dearest friends the chance to wish you well and shower you with gifts. Get it? Shower? How many guests are you planning on inviting? What type of atmosphere would you like the shower to have? Formal or casual? Will the venue allow you to decorate or will they take care of it? What type of, and how much, food will be served? Can you customize the menu? And do they accommodate special diets? Do you want alcohol served at the shower? Will the venue allow shower games and party favors? Is there space for a large number of gifts? And a place where they can be opened? Andiamo is a restaurant and banquet space with lots of options. Whether big or small, they have rooms that fit the size and tone of your party. Their large banquet center allows for a more formal affair. Or choose one of their smaller spaces for intimate gatherings. Plan a vibrant party on the patio or a warm meet-and-greet in their wood-adorned Loggia. Whichever space you choose, most have beautiful views of Dearborn’s natural surroundings. Andiamo can also help you plan a delicious Italian-inspired menu. This elegant location is tucked away next to the picturesque Rouge River. When the weather is right, Dearborn Hills Golf Course offers a lovely outdoor setting on their lush, green lawn. Or, for a more traditional backdrop, you and your guests can toast to the bride next to the cozy fireplace in the banquet hall. Their banquet department helps with all the logistics, including food and beverage options. Plan a light repast or a full sit-down meal. Their staff will ensure it’s an occasion you won’t forget. Henry Ford Museum: Surround yourself with some of history’s most notable artifacts. Greenfield Village: Plan a group picnic at the best summertime venue in Michigan. Lovett Hall: For an air of elegance, plan a large bridal shower complete with crystal chandeliers. Ford Rouge Factory Tour: If you love the automotive industry, plan a fun and informal party in a working factory. Like many of the spaces we’ve mentioned, the Fairlane Club is an elegant location for your bridal shower. They’re more than willing to accommodate all your needs and will customize their spaces and menu to suit your specific desire. However, if you’re looking for a day to refresh and revitalize with your girlfriends, then this is the place for you. Their onsite spa offers a variety of services. Prepare for the big day with a relaxing massage or beauty treatment. It will be a shower experience unlike any other. The Henry, Autograph Collection is often used as a wedding location, but it’s also available for more informal celebrations, like bridal showers. No matter the size of your party, the Henry has a dozen different rooms to choose from. Each has a distinct charm and will add sophistication to your soiree. The Gallery is perfect for smaller affairs, featuring a grand piano and tall windows that let in ample natural light. Other ballrooms can be rented if your guest list exceeds 80 people. If you’re looking for an intimate occasion for only your closest friends and family, then the award-winning eatery TRIA is the place for you. A party at TRIA will be a bridal shower your friends talk about for years to come. The service is impeccable and accommodates every need or request. But what will really put everyone over the moon about TRIA is our incredible selection of food. TRIA works with you to plan an inventive menu using only locally sourced ingredients. Plan a delicious menu ahead of time, complete with unique appetizers and craft cocktails. We can accommodate dietary restrictions of any kind. It’s a bridal shower with a foodie twist! The best part is you can enjoy the party while TRIA takes care of all the details — including prepping, cooking and cleaning. If you plan to party well into the night, consider staying at the elegant and luxurious Henry Hotel. TRIA is located within this notable location. You can make your bridal shower an extended weekend event for everyone invited.